Former Chief of Defense Staff Vice Admiral Matthew Quashie has refused to vacate his official residence, two years after his retirement and eventual replacement with Air Vice Marshall Samson Michael-Oje by the then John Mahama administration, MYNEWSGH.com can authoritatively confirm. This development, we can again confirm, has led to a situation where the state has to spend extra money to cater for the accommodation needs of current Chief of Defense Staff, Major General Obed Akwa. Major General Obed Akwa was appointed by H.E President Nana Addo Dankwa Akufo-Addo as the acting Chief of Defense Staff (CDS) in February 2017. Until his appointment, Major Akwa was the Chief of Army who also served as the Commandant of the Kofi Annan Peacekeeping Training Center staff and took over from Air Marshall Samson-Oje who also retired in February 2017, without also having occupied the official residence because of Vice Admiral Quashie’s refusal to pack out. 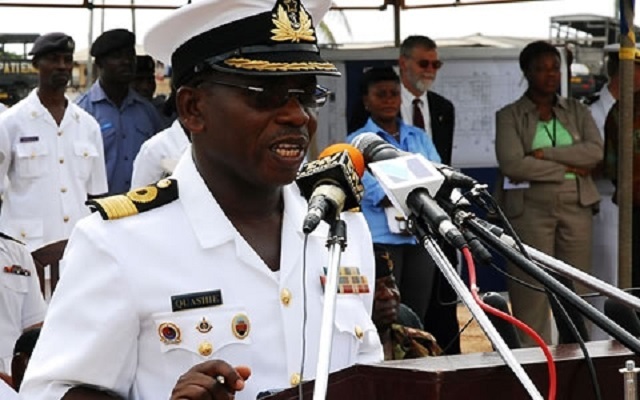 Vice Admiral Matthew Quashie retired and was replaced with Air Vice Marshall Michael Samson-Oje in April 2016, few months to the December 2016 elections that saw Mr. Mahama’s defeat. Vice Admiral Quarshie was appointed an Ambassador Designate by the then government. With a second “new” CDS in place, Vice Admiral Quashie has still refused to leave the residence despite persistent calls for him to pack out. MYNEWSGH.COM’s sources say it has become tough for the current Chief of Defense Staff (CDS) to effectively operate, as he has to even hold meetings with official delegations at Burma camp; with his personal home not spacious enough to even accommodate the guards. Authorities have written several letters to Vice Admiral Quashie to vacate the residence and allow his successor to take over without success. MYNEWSGH.com is unable to at the moment disclose other details of the location of the official residence of the CDS, for security reasons. Former President Mahama, the man who appointed Vice-Admiral Quashie as CDS was himself denied permission to stay in the official bungalow he occupied while in office. Mr Mahama’s failure to vacate the house when his term ended caused huge controversy. He said he reached an agreement with the new President Nana Akufo-Addo’s team to remain there in the aftermath of the election. But Yaw Osafo-Marfo from Mr Akufo-Addo’s team had said the request could not be accepted. “We have not approved of his request, and I want to repeat we have received the request and the requests are two – for him to be given his ex-gratia where he lives and also be given another property as his office,” MYNEWSGH.COM reported last year.